A capital R, crowned, signifying Richard III. 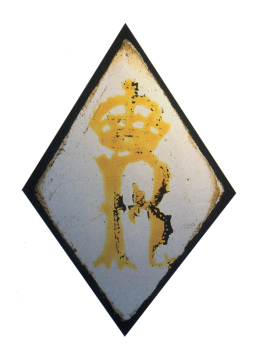 However, another less likely interpretation is that the R stands for Rex and was originally paired with an H for Henry VII. Other examples can be found in the Burrell Collection, Glasgow, and the Chapel of King's College, Cambridge. A variant in which the crown encircles the R is at the Victoria and Albert Museum, London. A similar panel is illustrated in the exhibition catalogue Images in Light: Stained Glass 1200-1550 (London: Sam Fogg, 2002, Cat. 47). This is one of four small lozenge-shaped quarries (see SG54, SG54.B and SG54.C, see also L133 and X255). These are amongst the few pieces of English glass in Soane’s collection. MS Inventory ‘AB’ dated March 1837 (a fair copy produced from a number of drafts prepared between 1835 and 1837) produced by George Bailey, first Curator of Sir John Soane’s Museum, the earliest record of the Museum’s collections, dated two months after Sir John Soane’s death, lists amongst the works of art in the Study: 54, 54*, 54** and 54*** Four lozenge shaped quarries with devices stained in yellow hung to sash. His entry is annotated by Wild One glass broken out J.A.W. June ’78 (S54.C). Bonomi’s 1875 Inventory repeats the Bailey entry without comment, implying the four quarries are still hung in the Study window. When Bonomi’s Inventory was checked by George Birch in 1874-75, he ticked the entry to indicate that the items were present but added in drawer. Spiers installed the three intact quarries (SG54.A, SG54.B and SG54.D) in the Hall when he re-arranged the glass there in 1908. The source of these panels is not known but it is significant that Bailey, thought that they ought to be numbered and listed with the Works of Art: the only pieces of glass to be included. This was presumably because they were regarded as being of value as older than the other glass and perhaps of English antiquarian interest.